There’s something really delightful about the experience of eating outdoors and indulging a roasted weenie skewered on a charred tree branch while listening to owls hoot in the distance. It’s middle class Americans’ way of dipping into nature, of forgoing our mattresses and heaters and other creature comforts. 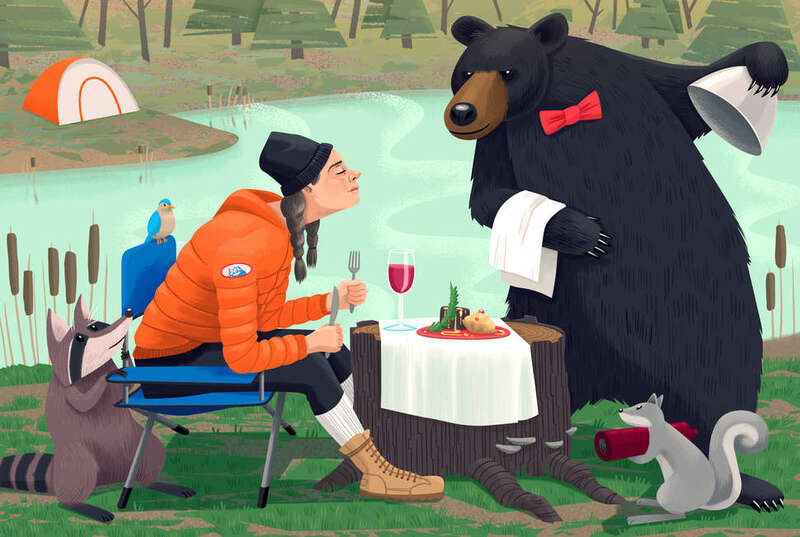 That same act of roughing it conjures up visions of meals that we imagine rugged mountain people eat, like trail mix, pre-cooked hot dogs, and river-cooled six-packs of light beer. It’s hard to deny that, for most of us softcore campers, camping food’s reputation is bolstered by hazy-eyed nostalgia. But on a recent trip to REI, the camping and sporting goods store, I was amazed to come across the aisle of pre-packaged camping meals, which seemed to have as much variety as my drawer of takeout menus at home. I could buy bags of classics like parboiled rice, lentil soups, and jerky, but I also saw freeze-dried pad thai, enchiladas, bibimbap, and Cuban moros y cristianos (black beans and long-grain rice). The meals could be cooked up with a few cups of water, boiled on your wood-fired Bio-Lite while it charges your cell phone. Our pursuit of #VanLife has made the US camping industry balloon in recent years, netting $19 billion in revenue in 2016 alone. We’ve come a long way from hot dogs and trail mix. Camping food is finally good -- and diverse. The food people have historically eaten while on the move tracks really closely to the preservation methods available at the time. Without any means of safely storing perishable food beyond its initial freshness, armies, migrants, and nomads would have to rely on what they could find day-by-day -- that, or roll the dice and eat that day-old venison. Luckily, salting and drying food saved the day, but it takes time. People have always dehydrated and cured food for preservation purposes: just add salt and/or sun, and you have a foodstuff that can last for days or even years. By pulling moisture out of food like strips of raw meat or fruit, we can make it inhospitable to bacteria growth, making it safer to eat long past its harvesting. Dehydration also concentrates nutrients and reduces the weight of food so you can carry more at a time and get more nutritional bang for your buck. For instance, we can credit the Cree people of North America with pemmican, a compressed mix of dried meat, berries, and fat that traders, hunters, and explorers have used to sustain themselves for centuries. The Quechua and Aymara people of Peru also pioneered freeze-drying in the 13th century with chuño, dried potatoes that could last decades in storage. Until fairly recently, that’s how most armies operated: they were expected to supplement whatever meager rations they received -- sometimes just a sackful of wheat berries or crappy wine -- with off-the-clock hunting and “donations” from the farms and villages they passed through. Anyone who’s played The Oregon Trail computer game could tell you that the length (and success) of your field expeditions depend largely on how well you can keep everyone fed. So until you’re able to secure a dependable food source that is lightweight, nutritious, and non-perishable, roughing it for fun just isn’t possible. In the United States, we generally recognize that the first modern, organized leisure camp was set up by Frederick and Abigail Gunn, who ran a school for boys in Connecticut, in 1861. The Gunns and their students spent two weeks traipsing around in the woods, fishing, and learning about nature, and the couple continued to put on these trips for the next twelve years. It’s no coincidence that the trip happened while the country was in the midst of the Civil War: the industrialization of the Union’s food supply gave them a huge advantage in the conflict, since soldiers were able to march with more dry food than ever before. Thanks to advances in technology, hardtack, the dense, high-calorie wheat biscuit favored by British sailors, became the backbone of army rations in this period, sustaining soldiers for longer and cheaper than rations could before. This kind of innovation made it much easier for people like the Gunns to imagine camping for sport: it took a lot of stress out of providing food for an army, let alone a group of schoolkids. In the 1950s, the advent of industrial freeze-drying, also known as cryodesiccation, changed everything about the way we ate food out in the warzones and camping grounds. By combining freeze-dried ingredients with water, campers and astronauts alike could enjoy “homier” food like applesauce and chili con carne without having to lug around heavy cans and bags. This kind of technology is more expensive, however, which is why that freeze-dried bag of pho is $4.50 per serving and your average cup of air-dried instant ramen is $.35. Commercially available MREs, or Meals, Ready to Eat, are also popular among hikers, campers, and, famously, survivalists. Made by the Department of Defense to provide service members with hot meals out in the field, MREs are packaged individually and are easy to heat up in a pot of boiling water. Ever have a Tasty Bite, those wonderful little packets full of pre-made vegetarian Indian stews? They’re basically that! Newer MREs even have their own flame-free heating elements, which boil the contents in their package when exposed to water, making them really handy for burn-ban periods, when campfires are not legal. Like the camp food at REI, MREs have evolved with the times, reflecting the more diverse palates of their user base. Whereas they were once all about hot dogs, turkey in gravy, and BBQ beans, now they provide shelf-stable tortillas, fried rice, and ratatouille. Frankly speaking, the standards for camping food are just higher than they have been in the past. I asked some outdoorsy friends for their opinions and this response was fairly representative. (Though to be clear, my friends are generally not the kind of people who don’t care about food.) “A critical component to camping is making really good food and enjoying yourself,” a friend wrote via text message. “I feel like most people missed that memo and always seem to think that camping = eating garbage.” He doesn’t often splurge for the fancy stuff, but understands that they’d be helpful for extended stay camping trips. For example, two servings of Good To-Go’s pad thai amount to about $13, which is way more expensive per serving than whatever unphotogenic mush you can throw together with canned biscuits and ground meat. For shorter trips, my friend just opts to cook carefully packed fresh food over a camp stove. The huge selection of camp food recipes online, on blogs like Fresh Off the Grid and subreddits like /r/TrailMeals, shows that my friend isn’t alone: many people do want to eat healthier and more interesting food while they’re roughing it. Camping is quintessentially American, and it’s fascinating to track how it evolved along with advances in warfare—arguably another quintessentially American pursuit. 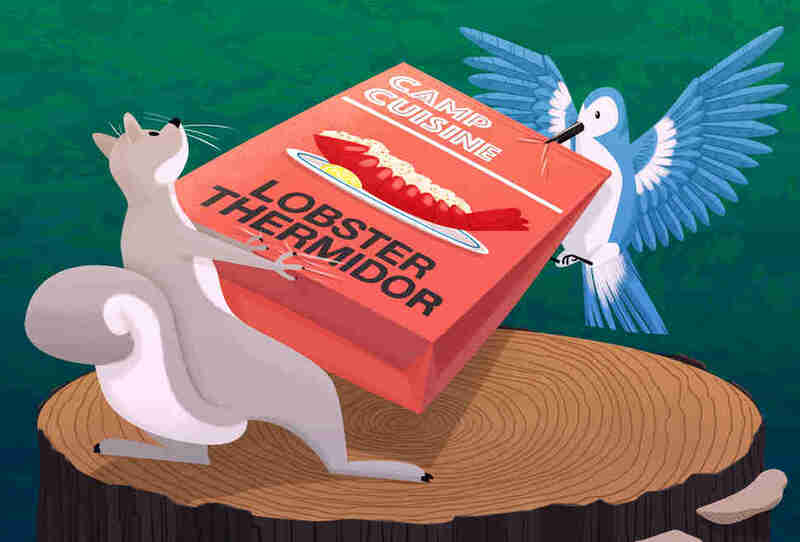 The packages of pre-cooked or dried food that you’ll find at the store have a storied history, showing just how deeply our changing tastes in food have affected what it means to “rough it.” What’s next for camping food? Are we creeping ever closer to a future where Star Trek’s replicator, which could synthesize meals (and tea!) on demand, is a casual reality? One thing’s for sure: rehydrated mushroom risotto with caramelized onions and pestos is a lot more photogenic and Insta-friendly than hot pot made in sweaty iron helmets. Soleil Ho is the restaurant critic at the San Francisco Chronicle and she would like to remind you that fish sauce goes great in guacamole.